Every student should have the opportunity to succeed and achieve their greatest potential. I believe in using various instructional strategies and a variety of settings in order to teach to the whole child. My role as an educator is to know my students and their strengths and challenges so that I can adapt my lessons, so that all students are able to be successful. Students must be educated to participate in world of rapid and complex change. Students need to develop multiple literacies and acquire a range of 21st century skills. In order to prepare students for this unknown future, I need to foster interactive engagement, so students experience meaningful learning and intellectual development. My role as an educator is to promote student learning and critical thinking skills to prepare them to become engaged citizens. I believe in using inquiry based learning, through big ideas, where teachers are no longer teaching information, but rather facilitating learning. The teacher is there as a guide, to set up learning experiences for students to ask questions and shape their own learning. Ensuring my classrooms focus on the process, not the product. Classrooms should be considered studios, a comfortable environment where there are few lectures; the students work collaboratively in groups to learn, the students are engaged in their learning, and become independent lifelong learners. I think the classroom should expand beyond the four walls of the classroom. 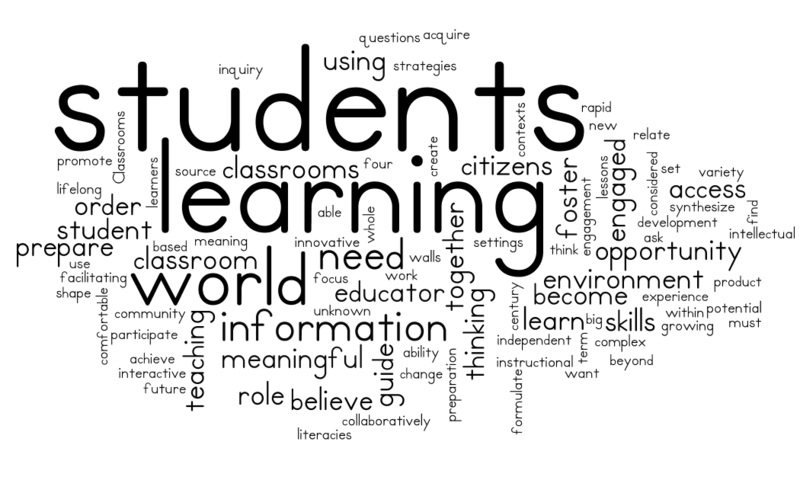 It is important the students learn within meaningful contexts that relate to their lives, community, and world. Students are growing up in an open source world and have access to the world through innovative technologies. We need to apply this access to the world in our classrooms as well. This can be done by teaching students how to use technology to find information and with the information the ability extract and synthesize it to formulate new meaning. School is preparation for life. I have the opportunity to guide and create good citizens. I want to foster an environment where my students are learning together and thinking together long term.